DRS Cycle team makes its record run at Bonneville. 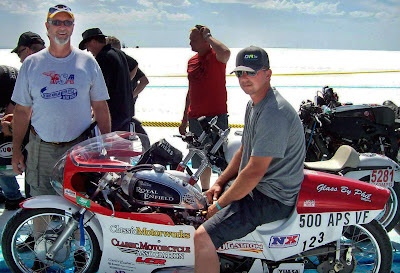 Dan Holmes and his DRS Cycle team left the Bonneville Salt Flats this year with a record despite wind, rain and a blown motor. The team ran out of time to compete fully in both gas and nitrous oxide classes. "We were disappointed that we were unable to run our spare engine in fuel," Dan wrote me. "We were lined up waiting for hours after having made a heroic effort to change engines and run the spare for the first time. We ran 105 mph in gas, which was the exact same speed we ran with our A motor, only with higher temperature and humidity. "The density at altitude is a major factor and normally aspirated engines are at the mercy of Mother Nature. We realized since it will run we needed the NOX to create our own atmosphere. We jetted it for the max — we consulted Glen Kyle, our engine builder, and he said go for it. "Incidentally the reason we were in this situation is we ran a 10 horsepower call in fuel and went 120.9 one way — we then went to a 20 horsepower call and we believe we were running 120 mph plus when it went bang! "We later found out that the tank vent was plugged; we fixed it and hurried back. We wanted so very much to be billed the World's Fastest Indian Bullet! Dan Holmes with son Nathan. "In any event we suffered through and were waiting and waiting; then the rain came. We were hoping it would pass by but it was a gully washer. 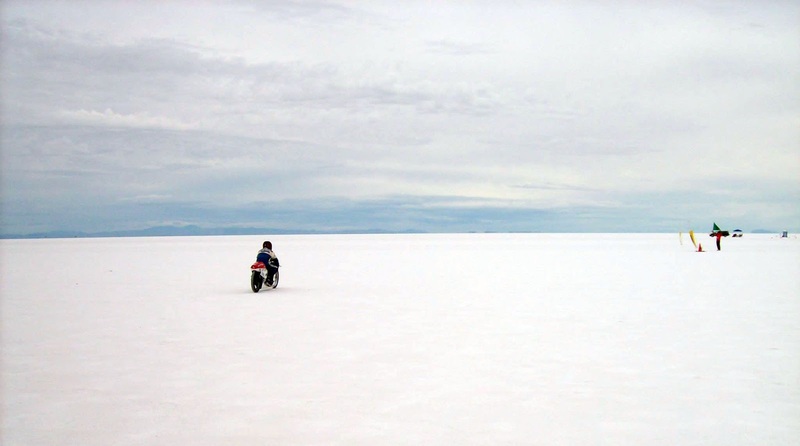 "We left the salt with a record but it is sort of shallow: our two-way record is 105 mph and this was with a 120 mph pass and a return run of 91 mph coasting. We are confident we can run 130 plus; just did not get a chance to prove it! "We do have a record, so mission accomplished, sort of!" 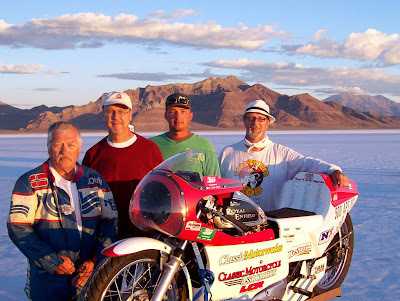 You can see more pictures of the Bonneville Bullet team in action on the DRS Cycle Facebook page. 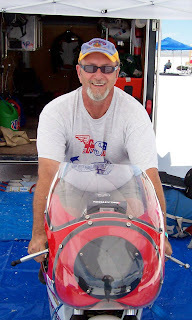 Johnny Szoldrak was the rider, Jim Myers was the team's primary team sponsor and electrical engineer. Johnny Szoldrak, Jim Myers, Nathan Holmes and Daniel Holmes at Bonneville Salt Flat.